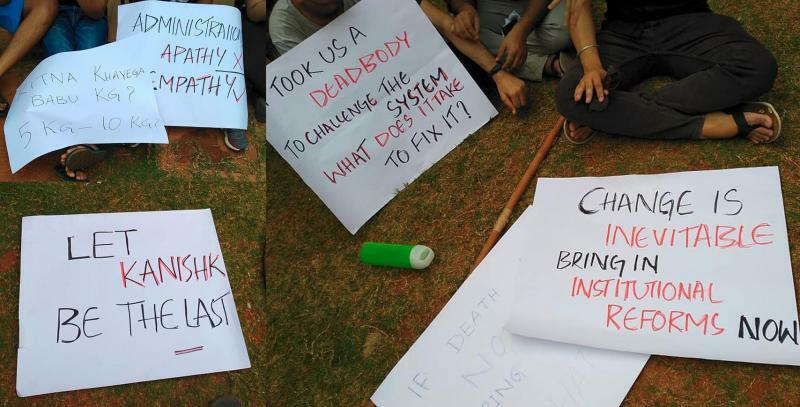 It is understood that the priority concerns are to ensure there is adequate health infrastructure and sensitivity to mental health issues on campus. These kids are concerned that with Prof. Venkat Rao's term coming to an end who would ensure that they pass out in time. The faculty is rubbing it's hands with unconcealed glee, finally it's getting the opportunity to show that it counts for something and has come to believe that it can now make these kids pay attention in class and take the circus called examinations seriously. Kids, fight back and be assured that we, your benevolent elders, don't relish the idea that you suffer and go through the same grind and torture that we did go through for five years. Take up the cudgels and don't give in to the blackmail which will surely now follow. Promises given are not to be fulfilled-- this is the motto of my Alma mater. Health infra and focus on mental health awareness are fine and laudable goals to strive for, but most of their so-called suggestions as reported in that edx newsportal, if true, are nothing but preposterous and reeks of entitlement and simply meant to dilute academic standards. If these are the current grads Law School is producing, then I shudder to think of the future. These are supposed to be the best and brightest of the future generation, who want additional marks for submitting projects on time and do not want to be failed despite actually having failed papers. Such entitlement, much wow! I agree with you. The present generation is too lazy and entitled. So-called mental health problems are being used as an excuse to dilute standards. Even if they have Harvard professors teaching them they will make the same excuse. No disrespect meant, but if this is what they are protesting about, it means they are lucky for not facing problems that other NLUs have (corrupt admin, bad faculty, poor infrastructure, unsanitary conditions etc). Other NLUs would call these "rich people's problems". Please do a #NationaliseNLUs protest and not this. Indirectly, it will help solve this problem, as more funding means more funding for counselling as well. The name of the college is NLSIU Bengaluru, not NLS Bangalore. Kian, in that case you must also say GLC Bombay, NUJS Calcutta etc. Thanks, wasn't aware. Was there a formal notification of this name change? Logo is different. They are calling it Bengaluru on their brochures and website, the city has been renamed and that's all that matters. The logo has Bangalore because NLSIU was established when the city was still called that (unlike MNLU Mumbai or NUJS Kolkata). But if that is your yardstick then GLC should be called GLC Bombay, as it was established before the name change. I can't understand why NLSIU has to get this special treatment from you. See what these students have told Edex: we demand lower attendance requirements and don't fail students. What rubbish is this?? Do you want to become "Harvard of the East" or Dantewada law college? If you feel students from marginalised backgrounds suffer, then have a system like IIT, where students admitted through SC/ST quota attend a 2-year bridge course first and then join the BTech course. Also, you cannot get promoted if you fail core subjects like tort, contract etc. Don't know why people are obsessed about attendance. If people can study without sitting in classes and use their time more purposefully, then more power to them. This does not reek of entitlement. No detentions on the other hand is ridiculous, and will lead to the equivalent of the CBSE idiots who score 100% because of grade inflation. Because people don't (sit and study and use their time wisely) at 17/18 when they are away from home for the first time. Also, if they wish to then IGNOU exists for that reason. By all measures use it. However, if you wish to use the name of any prestigious institution, then you must meet its bare requirements (which as of now is that you miss every 4th class in any subject). Almost all institutions have some such requirement the world over. The other alternative which is to do away with the attendance requirement, but make the exams quality ones is also there. If you ask me questions that I can answer even without having attended your classes, then that speaks volumes about your ability as a teacher. The problem is that few teachers would agree to spend that much time on framing quality application based questions on the basis of class discussions, which is unfortunate. As a teacher, I let my students know in the first week that they are free not to attend if they don't feel like. However, not many who chose not to pass my exams (and we chose answer sheets as an university). So please don't say things as if you were the first to think of them. There are enough people here who allow space and we have seen those not attending fail consistently over the years. Does this mean you fudge attendance for those who don't attend? Because given the BCI mandate of 70%, how else do they even get to sit for your exams to fail? If you do, that's not a very good example to set as a teacher, right? Allowing adults to make a choice isn't a great example to set? The problem with the NLUs, the administrations and the students is that each is set on infantalizing and on being infantalized. Hence we have cases of admins being paternalistic and also cases where students fail to take responsibility for their acts. So instead of trying to change a set of problematic rules, you teach them that it's alright to break rules and essentially commit forgery when the outcome suits you. That's not treating students like adults, that's teaching them lack of respect for any rule the moment their interest gets affected by it. What you fail to realise is that as legal academic and activist, I find that there are things far more problematic in the world worth my time than the attendance policy of one institute. I chose to concentrate on fighting them and provide my students space to think about them. Also, I don't think having to attend 3 out of 4 classes is a problem. I chose to disregard it on a personal basis but don't feel it a colleague wishes to enforce it then he or she is doing any disservice to the cause of education. What I am basically saying is - get over the attendance issue. It is a very first world problem which you can negotiate out of with some Profs and have to bear with others. In any case, get over it. The world of Law has far more worthy causes. What I'm saying on the other hand is you don't get to pick and choose which law to follow and which not to. Following a law when it's convenient to follow does not require conviction, everyone will do it anyway. If you don't like a law, by all means protest actively to change it and bring reforms. But by simply showing them by example that laws can be broken at will, I doubt you are doing them any long-term favour. Extending your logic, if a student feels, rightly enough, that exams should be open book instead of mugging useless sections up, he should feel free to cheat in a closed book exam so long as he isn't getting caught, because as an adult that's his choice. If it is your conviction that the rule or law is bad, then disobey it and take up responsibility for it, don't try to sneak through. Tell the university that in your opinion as a teacher, a student getting actual 10% attendance in your class must also be allowed to sit for the exam. You are applying morality selectively and trying to assume the moral high ground for that. Students should have better role models than that. And what I am saying is that every (law) student needs to know when to fight something as a matter of strategy and when one shouldn't. If you disagree, do that by all means. If you think someone needs to fight the attendance requirements, go ahead - fight. But that is a fight you chose, not me. That has to be your fight, not mine. On a separate plane, my institution knows I don't stop students from writing my exam on grounds of attendance. They let me do it for what I bring in terms of competence in the classroom, and what I bring in terms of my research and writing. I don't fight on an institutional level, as I have stated previously, because I don't think this needs to be an institutional policy. You are saying contradictory things. If you mark students present despite them not being so, then on pen and paper, that student is fulfilling the attendance requirements. So the institution need not be actually aware of how many students are giving your exam despite not having requisite attendance. The issue is also not about whether or not to fight the attendance requirements. The issue is about you actively indulging in what can only be termed as forgery in a more acceptable and less dangerous form and then coupling it with a sense of entitlement evident from references to your scholarship, activism and academic ability. You are not only therefore teaching your students to break rules everytime it suits them, but also expecting that to be appreciated and as stated in your first comment, taking active pride in it for exhibiting moral bankruptcy. You sidestepped the analogy of a student following in your footsteps and cheating in a close book exam. How do you expect to have the moral ground of criticizing that student given what you are showing them as acceptable? You want to argue strategy, by all means go ahead. Just don't make it equivalent to morality or respect for rule of law. The timing of the protest is odd. Rao is leaving soon and Sudhir is taking over. As an alum Sudhir will obviously be more aware and the students are also looking forward to having him. Is the protest just pent-up frustration being released at a time when Rao is powerless to retaliate? The protest is happening as they know they need to get these points pushed through now before Sudhir comes in. If they can't, then things will only get tougher under the old guard who will harp back to the golden era. The selfishness of the students knows no bounds. They refuse to take the lead in a joint NLUs protest as they are in the first place and don't want others to progress. Instead, they protest on selfish non-issues to make life easier than it already is. Where are Day Zero/ PPO figures for NLS? Friends, please vote for BJP in the election. It is the only party that has a nationalistic outlook and will be open to nationalising NLUs. The ABVP has also supported protesting students form other NLUs and support administrative reform at NLUs. Thank you. 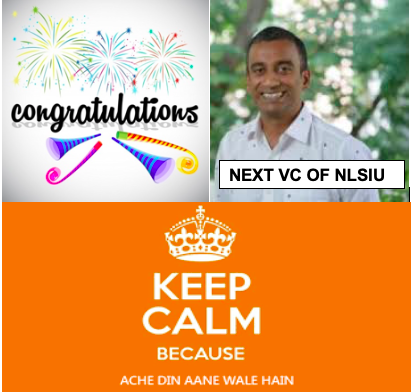 Ay updates on Rahul Singh's blueprint to make NLSIU crack the QS rankings?? If Sudhir comes in, Rahul's influence will be on the wane. Any updates on the domicile quota bill? Is it being applied this year?